Your home, any owner can call his fortress, And every fortress starts with a fortress wall. In our time, this wall is the fence. Its design (deaf or transparent) and the material can be selected on the basis of the General registration of land, the house. Recently, the corrugated sheet is used for this purpose more often. - wide colour range and minimal costs of its maintenance during the subsequent operation (do not need additional investments on a seasonal painting, repair). The construction start of excavation. Wind load from the fenceand corrugated very serious and therefore supports that need to be placed around the perimeter of the site, must be securely fastened. Depth of holes under the rack can reach up to 150 cm. please ensure that at this depth there are no communications. Making sure that work is safe, proceed to the production of Yam under the rack. With the help of an ordinary drill (hand or power) drill in the ground holes with a depth of 0.9-1.5 m. the Distance between them should be 2-2,5 m.
Supports fabricated from pipe (diameter not less than 60 mm) or profile of the "square". The prepared metal rack set in a pitted, pre-pour them in the gravel. Stand position on the perimeter fencing of the territory, dividing it into areas with the same terrain. Height adjust the thickness of the layer of crushed stone, fill in the holes. Align the supports vertically and sebaconitrile. 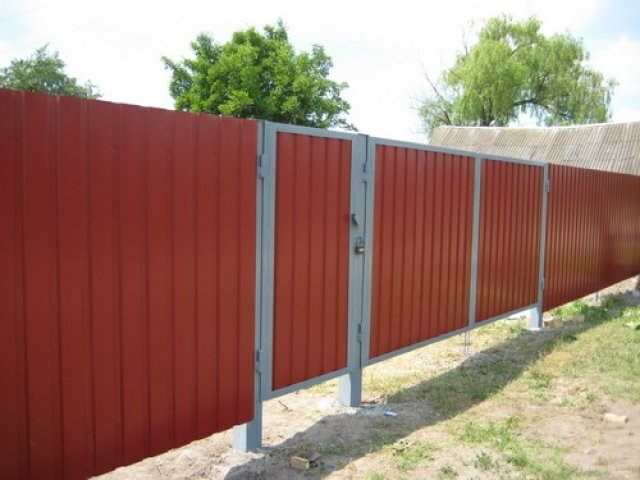 Depending on the height of the installed fence,and select a number of cross progerin to which will be attached to the sheet metal. At the height of the fenceand up to 2 meters is enough to set one flight 2 prozhiliny. Their manufacture of shaped square or rectangle with a wall thickness of at least 3 mm. Welding attach prozhiliny to installed the metal supports. Cover support and prozhiliny primer. Sheet metal install close to prailine at a distance of 5-10 cm from the ground. Using "wave" drill holes in it and the wall profile of square prozhiliny. Through the drilled holes, secure the sheet with screws or rivets. The gap between the lower edge of the sheet and the earth is best to complete the laying of brick or natural stone. 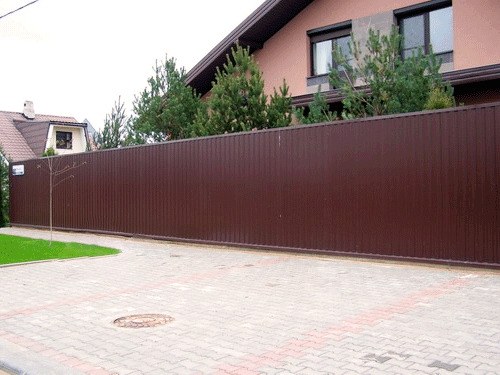 - The rack of the fence, to avoid the ingress of excessive moisture, close the decorative "cap". 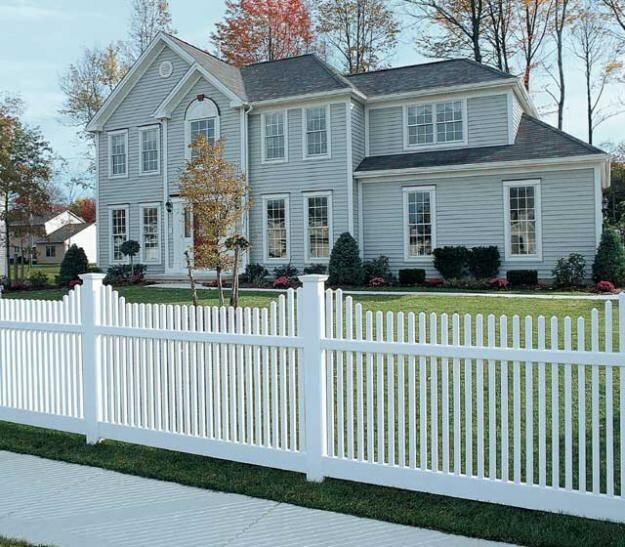 To set posts for a fence, it is important to consider the condition of the soil, the material of the poles themselves and to prepare everything necessary for the job. Should not only to set the props, but also properly to fix, so after the first winter didn't have to redo everything and spend time on one and the same work two times. You can put any posts: wood with iron or asbestos cement. Before you begin to dig or to drill holes for mounting, make marks at posts. Hammer bars are slightly wider than will stand themselves pillars and pull a thin wire, nylon thread or cord. Thus, you need to mark the bottom, middle and top. Then mark the distance between the posts. It must be the same and match the length of the material you are going to strengthen the quality of the fence. The pits under posts you can dig with a shovel or to drill. If the soil is weak and prone to heaving during frosts, the method of hole punching is completely different from the hole with a shovel. You can dig or drill, but the pillars still need further strengthened. This will require chippings. The depth of pits for the installation, you need to do the same and not less than 50-60 cm In the loose soil you need to dig even deeper given the fact that the bottom of each pit will have to pour sand on him to tamp the gravel and only for the cushion to establish themselves poles. And it will have to do together. One person will hold the post, the second – fill the pit with gravel and to tamp it. It is a versatile method of installation and suitable for pillars of any material. Before installing pillars of wood, you should treat it with a layer of antiseptic. After drying, a layer of a waterproof primer and top apply mastic of tar, which you can buy at any hardware store. This treatment will extend the life of wooden posts many times, and they shall stand no less than iron or asbestos cement. For greater strength, and most importantly, self-confidence, you can set the bottom two sides of the row of pillars, the timbering of 20-30 cm and pour concrete. Get the Foundation for the fence, which will further provide protection of installed material from contact with the soil, and therefore, prolong its service life several times. 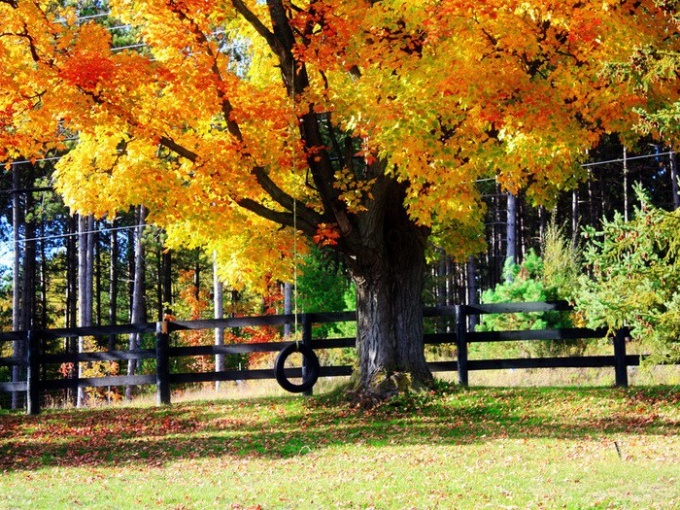 In order to set the fence or fence, you first need to drive posts into the ground. The use of special excavation drill to create wells beneath them, and the subsequent filling with concrete is not always justified and possible, so with not very high requirements to reliability of a design, you can try to drive the poles themselves. To drive a small pole with a small diameter and height (1.5 meters), use a regular hammer. Plug it in the right spot and lock (to keep it initially, maybe your assistant). Score first, weak beats, and when the post will surely stay in the ground, ask your assistant to move and strike with full force. To drive high and wide of the post, do special tool – grandmother (Baba). Take a section of pipe about a meter long. Inner diameter of the tube should be slightly greater than the diameter of the post, it is free on it was worn. Cut out of thick sheet metal circle corresponding to the diameter of the pipe and weld one end. Weld to the pipe end to something heavy like metal shavings. The total weight of the dough should range from 10-30 kg, the heavier it is, the easier it will be to score posts. Try to weight grandmother in the following way: from sheet metal cut a circle equal to the inner diameter of the pipe and weld is not the end but a few inches from the edge (from the inside). The resulting bowl pour the molten lead from broken batteries. From a solid rod cut two handles, about a meter long. The end bars bend at an angle 90⁰, it will arm. Weld the handles on both sides of the pipe, opposite to the heavier side. Handles should be long, to be not less than 50 cm down the tube. If possible, make a handle of variable length to change the length as clogging of the column. Arms can wrap with electrical tape to make it easier to work with. Install the column in the target site, the top put on his grandmother. Lift the design for the arm up to the 50 cm, then force it lower down. The severity of this tool will help you to score the pole smoothly and horizontally. The pipe will slide on the pole, and the blow is always directed along its axis. To facilitate the upgrade of the headstock, install the tripod, towering above the upper point of the post. On top of the hook block, and to the grandmother weld a solid hook. Take a strong rope or chain and tie it to a hook, pass it through the block. For the other end of the pull, thereby raising their grandmother, then abruptly let go. Clogging of columns with the use of such instruments will be held for you very quickly and without much difficulty. 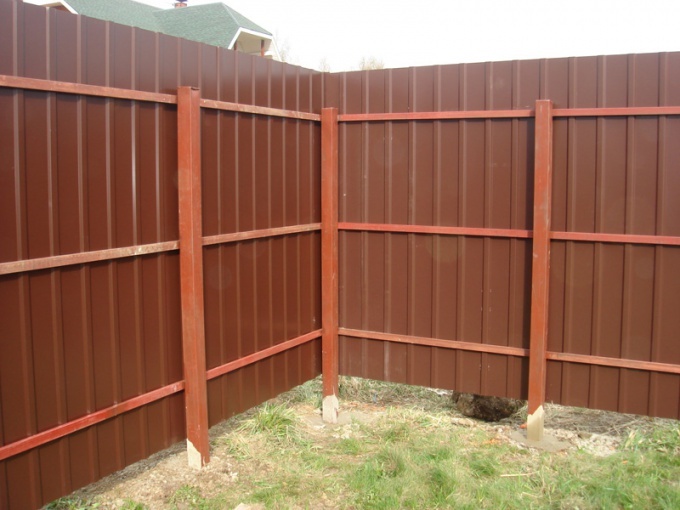 On what columns you select for your fence – wood, metal, concrete, asbestos – will largely determine its longevity. But it is equally important to properly install poles, mounting method should be chosen depending on the depth of groundwater, composition of the earth, the value of the fence. On light or sandy soil to install small posts, use the normal hammer. Place the pole upright and, holding his hammer, until he is sufficiently developed. To facilitate the work, use the tailstock, is made of larger diameter pipe and welded on the one hand a plug, here, take a weight of lead or metal. The side weld of the handle. Put the pipe on the pole, vertically mounted, lift by the handles and drop down. To set large poles, or purchase a special drill book the drill rig. Drill with it, well a little below the depth of soil freezing, pour a bed of sand. Next, install the inside the post and fill the remaining space with concrete or cover with soil and tamp. After pouring the concrete mix into the hole a bit and raise the pole. In this case the bottom part is also closed by a layer of concrete that will protect the wood from rotting and metal from rusting. In sandy soil you can do without a fill and compaction, simply drill the hole just under the diameter column. In this case, be careful that the hole was vertical and located strictly in line. Heaving clay soils with a high level of occurrence water use the following method. Drill out the hole obviously wider than the column diameter and deeper groundwater. Complete the back of the hole with fine gravel and sand so that there is sufficient depth for immersion of the third pillar. Tamp the drainage and install a pole. The space around the column fill with fine gravel, sand, and tamp thoroughly. With this method of installation, the groundwater will be free to go down and can't push the pole out of the ground, he will stand firmly and not mowing over time.